The section of the Manhan Rail Trail connecting Northampton to Easthampton is proving to be very popular. 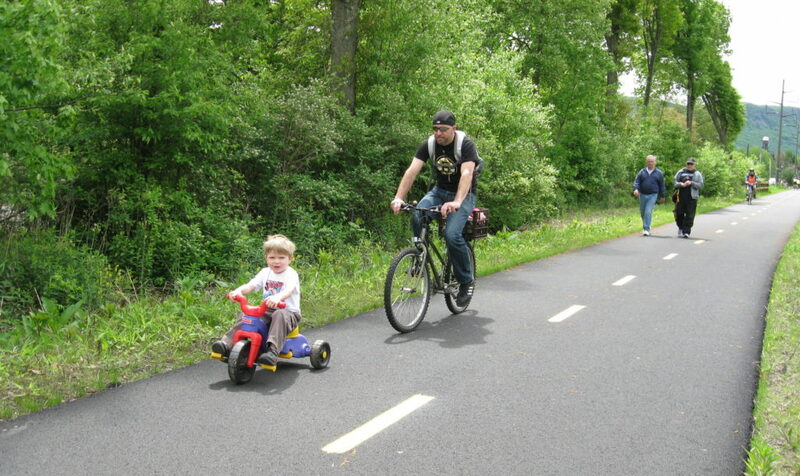 Nestled in the heart of the scenic Pioneer Valley of Western Massachusetts, Easthampton’s Manhan Rail Trail offers unique recreational opportunities to people of all ages and interests. The Manhan Rail Trail has a total length of 6 miles within the City of Easthampton. The trail continues for several miles into Northampton where it connects with a system of trails in that city. The entire length of the Manhan Rail Trail is paved. Easy—the trail is mostly flat with a few dips and a very gradual incline from Route 5 towards the center of Easthampton. Parking is available at the Easthampton Public Safety Building at 32 Payson Ave., at Millside Park off of Ferry Street, at the Northeast Center for Youth and Families (203 East Street), and at a small lot at the Route 5 end of the trail. Additionally, there is ample free public parking near the trail in the center of Easthampton. The northeast spur ends at Route 5 near the Oxbow; to the south, the trail currently ends at Coleman Road, Southampton and to the north, the trail connects with the Manhan Rail Trail in Northampton at the Easthampton City line near Lovefield Street. Restrooms are available year round at the Easthampton Public Safety Complex, 32 Payson Avenue, and seasonally at Millside Park along the trail just off Ferry Street. The Manhan Rail Trail is a multi–use trail. No unauthorized motorized vehicles (including snow or recreational vehicles) are allowed on the trail. Equipment used as mobility aids (such as motorized wheelchairs) are permitted. The trail has a small green and white marker on a post or fence every mile. If you or your organization wishes to hold an event on the trail, please contact Easthampton City Clerk, Barbara LaBombard, at (413) 529-1460. Video by Mass Appeal: WWLP Channel 22 News’ Mass Appeal published a story with a video about our trail: Family Activities Week: Live from the Manhan Rail Trail.